Recent statistics reveal that e-commerce businesses have grossed over a trillion USD, with over a billion users claiming that online commerce is definitely one of the most lucrative ways of conducting business efficiently. The expansion of internet has led to the transformation in the way trading and store transactions are being conducted in the present business scenario. It is very important for businesses to choose the right methods and channels to conduct their business. Amidst these different channels, online marketplace has created its own space. It offers to be an excellent and reliable option for retailers to market and sell their products. 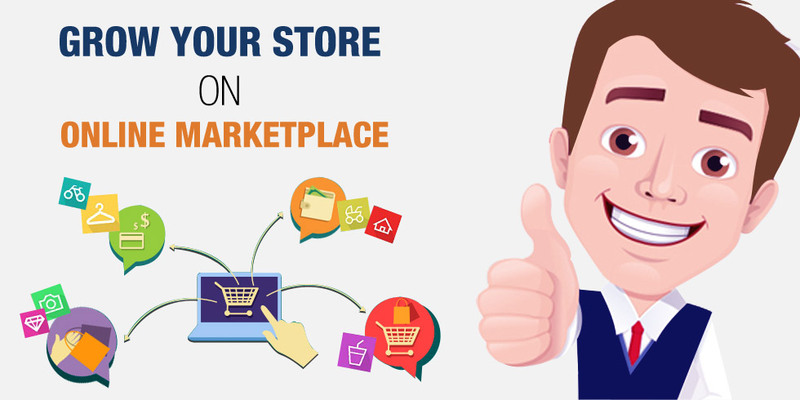 Ecommerce marketplace is basically a website that aggregates product information from multiple sellers, thus enabling users to browse and compare products from the different sellers listed on this marketplace. The marketplace owner strives to attract customers, whereas the online merchants manage their products and sell them directly to the customer. The online marketplace charges the listed merchant a percentage of the overall revenue, or in some cases, based on their product category or monthly subscription fee etc. Cost of managing the website will not be headed by the retailers. Website traffic and advertisement will be handled by the marketplace owner. Offers a variety & all-in-one aspect of the marketplace which helps draw in many customers. Retailers can gain repeat customers or business by offering satisfactory service & quality products. As a retailer, you should ideally study the products, and research for a suitable market where you can channelize the sale of your items. It is also important to understand the individual market or marketplace. Each marketplace has its own system, pricing and limitations. So, it is advisable that you opt for more than one marketplace that suits your requirement. Few online marketplace giants like Amazon, Ebay, Etsy, Newegg, Flipkart etc are ruling the ecommerce market currently. If you are looking to build an online Market Place, and act as a facilitator to the retailers to uplift their sales, then strategizing your product segments, retailers, policies etc in right way with optimum market research is a must. You should also have a strong and reliable solution for the online store. Nowadays, the e-commerce market is growing immensely bringing a stiff competition among the different solution providers. Amidst the different e-commerce solutions, Magento has been quite successful and reliable in creating excellent web store solutions. Its extensive features, flexibility, large community and availability in Enterprise & Free Open source is the main reason it is chosen as the solution for a majority of online stores. Magento easily suffice the needs for e-commerce website as well as online market place proving its versatility in this competition.